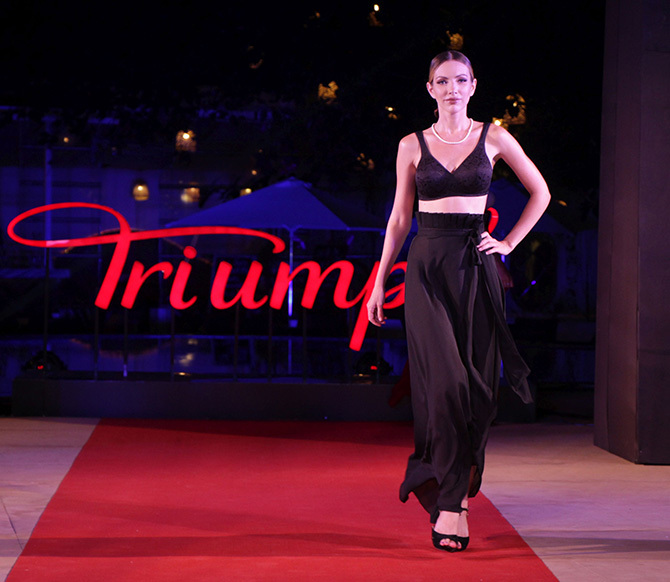 Triumph International India showcased its latest functional line of luxury inner wear. Leading lingerie brand Triumph International (India) recently unveiled its 2019 collection with sportswear brand Triaction at the 11th Annual Triumph Fashion Show. The show held at Park Regis, Goa saw stunning models flaunting the new range and having fun. IMAGE: The new series featured lingerie with delicate floral embroidery and delicate lace design. IMAGE: The full range featured exciting options for bigger women with larger cups in satin and lace. IMAGE: There were options in bright and bold colours like red and pink to regular ones like black and biege. The sensation series came with diamond mesh and bold-striped elastic trim for a contemporary twist. IMAGE: Who says innerwear doesn't inspire confidence? IMAGE: The right pair of lingerie can help tone your body and make you feel good inside out.